Hi Paul! You read for me a few months ago (about 2 months ago) and I wanted to let you know that the two biggest predictions you made (about me booking a singing opportunity) and a new job opportunity in the exact industry you predicted also came true! Additionally, your incredible positivity and warmth felt like I was getting a reading and life coaching/perspective overhall and I just want to say thank you, thank you...I know you have a gift! Can't wait for the next reading! Paul is an amazing Divine Angel of Light!!! I've had 2 sessions with him and each time he's so warm, open and engaging. I'm a metaphysician and energy healer and I can attest that Paul IS authentic!!!!! He's a natural. He uses the tarot cards, but only as a tool. His natural abilities were present and activated before we sat down for the reading, and he started reading immediately without me any asking any questions. He brings messages forth in such a loving and compassionate way that is just opens your heart and lists you spirit. He sees so clearly that I was amazed when I met someone and knew who he was just from Paul's physical and character description of him. And when he spoke about himself it was as if I was listening to Paul all over again. Paul's gifts are many, and they are rooted in his deep love for humanity and his desire to help people. 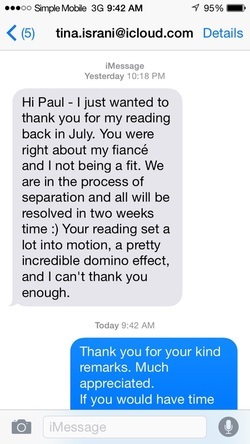 Everyone that I've referred to Paul has had the same experience... they are all very happy with their readings. This is my third time to visit Paul in the last two years and every time I am amazed by his clarity and vision of what is happening in my life. As soon as you sit down he starts to talk to you without even looking at the Tarot cards and is so on point. Paul is straight to the point and tells the truth despite if you are not ready to hear it. This will be hard for many people as they do not want to hear the truth, they want excuses. This is why I love Paul that he is so honest and does not give you false hope like other Psychic's I have been to in the past. I feel the review written by " Gastronomique" was one of those people who was not ready to hear what Paul had to say and got angry with him. My first time with Paul also was a bit hard to hear some things but when they happened as he described I completely understood his reasons to give me the news.I am so grateful for it, as it does not keep you stuck in the past. He describes to you what he see's in such a positive and exciting way that it is hard not to look forward to the new things coming into your life. I feel refreshed and exciting about the new events and my expansions in the future. He is so good at describing to you why you are making the same mistakes again and again and helps you understand and break the cycle. He teaches you how to look at what you want and get it. He is so informative and understands the universe so well. Thank you again for an amazing experience which is heart felt with a real caring nature. Your guidance has really helped change my life for the better. I had heard such amazing reviews of Paul's readings in NYC that I followed him to his new place out in Silver Lake, CA with my mom. We arrived at his well decorated apartment and felt his calm and welcoming energy immediately. As Paul read me, I heard things from him that I'd been wondering about myself. He clarified my future for me and set me straight on certain confusion in my own head. 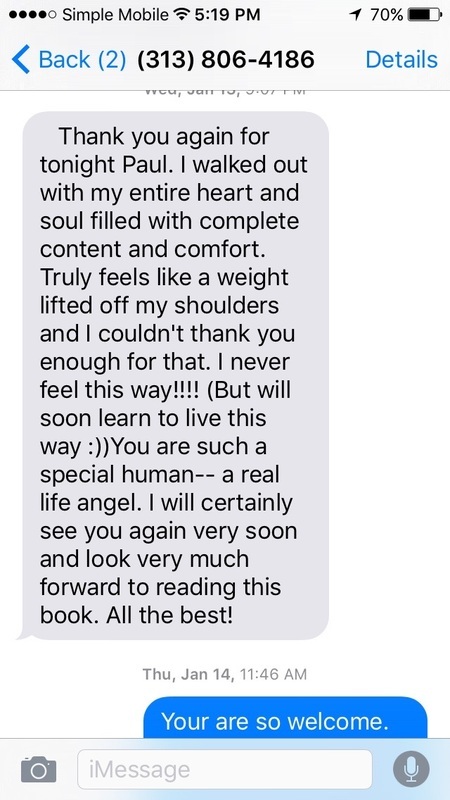 As an added bonus, Paul let me know that a beloved departed family member's soul was with me and had visited the reading a few times. It means so much to me to know that I have a guide on my left side at all times, and that I'm protected by this soul in some ways. I left Paul's reading with a deeper sense of self and a brighter outlook on my future. It was just what I needed in the perfect space, at the right time. I plan on calling Paul soon for a follow up reading. He is amazing. Hey Paul- I want to thank you for your time and contacting my mom. Your talent is undeniable and your compassion is incredible. You have no idea how much you've helped me. Then you topped it off with amazing generosity. This is Tomoe :) How are you? Hope you were able to see Kiu san after all! I've been wanting to contact you for a while and say THANK YOU!!!!!! for all your inspiration:))) I FINALLY started a design comopany w/ my mother in Japan this spring and came back to NY in June! She taught me weaving, plant dying, cooking, life wisdom... so many things!!! I'm truly thankful. During and after the stay in Japan & LA, everything what you said @ Jen Kao was getting real....It's been such an amazing ride!! It was hard to break my rules and tradition at the beginning, but I understood that was par of the process. You also mentioned that you saw mountains..... I thought you were talking about LA... then I realized that was my HOME TOWN in NAGANO!! !Everything made sense... All my clothes were inspired from the mountains I saw while I took a walk. Please take a look at some photos!! Hey Paul, it's Karl. I would just like to give you feedback from our reading. The main reason I looked for a psychic/medium this week was because my spirit was sort of... asking for someone that would give me a reading with no sugar coating about my bond with Robert and I found you. I DEFINITELY didn't expect the "no sugar coating" part was going to be about myself. The reading was NOTHING like I expected and it was amazing, with all sorts of emotions. I feel liberated for some reason, like you opened a locked door. I also feel enlightened. I'll never forget this event as long as I live. I'm sorry if I made a horrible first impression and was troublesome, from the 2 am phone call to the unplanned reading today before you went out. Thank you for everything and I appreciated your patience. Something tells me I'll be seeing you again one day. Take care of yourself and have a pleasant evening. P.S. - You have a VERY comfortable energy - different from anything I've sensed before. The meeting with you back in June has kept me inspiried. The things you had predicted to me, did not make sense to me at the time but now that they are happening it is all clear to me . You really do have a wonderful gift of insight and predicting future events. I want to THANK YOU again!! Hello, Paul. This is Takuya. I had a reading session at the end of November. I'm a gay man from Japan who is trying to find myself through my spiritual journey. You mentioned about fashion, and it reminded me of the other psychic also mentioned fashion briefly. It clicked. Then, I see fashion in a different way. Paul,Thank you so much for today. My heart feels lighter and I feel like I can think freely and clearly. Safe travels. I don't know if you remember with me, but I'm the young woman that you predicted will be travelling for a year and it's going great. I came to see you in February and I left in April, I've already been abroad for three months and shown so many kindnesses and received countless blessings. I went to Istanbul, Thessaloniki, Athens, Milan, Aulla, Barcelona and am now back in Istanbul. It's been a wonderful ride so far and I trust it will only get better. It's been a few months since I reached out and I wanted give you an update. while Y..... was sentenced to 3-9years, she was able to get into a boot camp program for 1st time offenders with a reduced sentence of 6 months as you had mentioned. She will be home next month! I also took your advice and started my own accessories business named after my late mother and it has been very successful so far. I hope you are well and we look forward to coming in to meet with you again soon!! I went to see Paul again, as other psychic cannot solve my doubtful. it's my second time to read with him. I read with him first time early of this year and then I read with him agian last week ago. I really think he's very kind and nice psychic. He read about my career, my financial and my love life. Something's happening this week related to my career, it's same like what he read it. My life's getting better like what he read. I tried to search accurate psychics in NYC. I've found his profilke by coincidence and then I read his recommends by many people. Then I made a decision to call him. I think he's very kind person who can guide me a good direction. He's not the type of psychic who only wants money. But he is the type of psychic who's very helpful. I'm very appreciate for his reading. I still wondered how he can know when I was waiting outside his door, I didn't knock his door but he opened the door on the right time. I didn't walk so loud but it seemed he may know by his sixth sense that I was standing outside his door on that time. Paul is extremely enjoyable to talk with, he is very kind and very gifted. I felt incredibly peaceful both during and after our reading and I am extremely grateful for the insight he gave into my life. He has given me hope and helped my confidence, I thoroughly apperciate his guidance as it helped me gain a clearer view on my life. I feel this will help lead me on the path to a much brighter future and I do hope to get further guidance for him in the future. I have already recommended him to a friend! I went to see Paul two months ago, and I was in a difficult moment of my life, where I wanted to change career and felt stuck. The reading was a supet pleasant experience, he's very sweet and full of insight. His visions are very accurate, and everything he told me came true, i trust him on his suggrstions, and now that My life has chamged around I could not thank him enough!! I could have not done it without him, and he was right about everything. 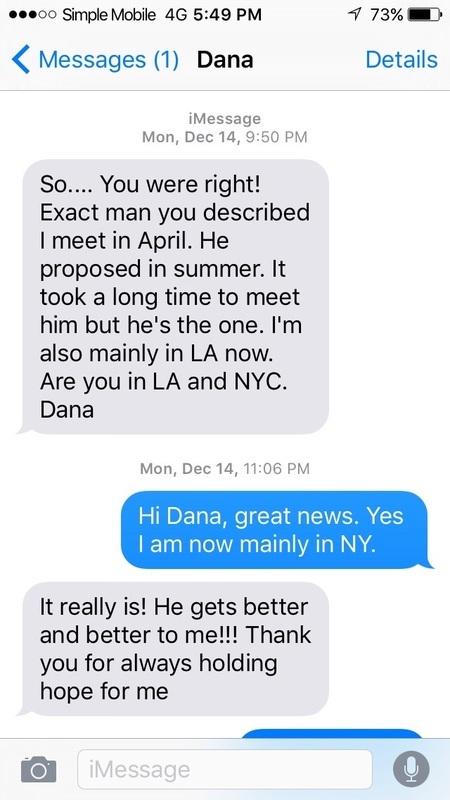 I went to Paul on my birthday in early March and even today I am still reminded about the things he said to me and how they are all working out like he said they would. I'll definitely go a back again for my birthday. He is very sweet. I rang his bell, called and called but he didn't answer. Apparently he took a sleeping pill and slept through the noise. He called me back, gave me a heartfelt apology and didn't charge me extra when we went over my time. I've recommended him to my sister and a friend as well. They will be calling soon. Paul has a true psychic gift! And, what's more important to me, he's a genuinely kind and intelligent person! I went to Paul during a very hard time in my life and I credit him with helping to give me the courage and positivity to move through some big stuff. My 15 yr. old son had been through a very bad ordeal at school, and Paul offered to meet him to see if he could help. It was a great reassurance. His compassion, as well as his guidance, are the things that propelled me to go back to him a few times over the last year! I have been to one or two psychics over the past 15 years and I know the real thing when I see/feel it! Paul is the real thing, baby. I'm obviously not a big reviewer and only review something if I feel really compelled to. Clearly my experience with Paul was quite compelling - so compelling that I went back a second time. An open-minded skeptic who'd never been to a psychic, I decided to give Paul a try after my friend and her sister raved about him. Overall, I found him warm and insightful and he definitely doesn't try to tell you what you want to hear just to please you. Paul was eerily spot on about SO many things - things so specific that it would take a one in million chance to guess. He was so spot on that I kept getting choked up, however both times I left with an overwhelming feeling of calm, optimism and confidence to move forward toward the future that I will create for myself. I wanted to give him 5 stars, but I'm tough - he didn't see that my mother passed away, something I thought would be obvious to a psychic, so I've taken away a star for that. I would give him 4.5 if I could! In all honesty, Paul is a life changer. He is one of the most insightful and sincere mediums, I've ever been to and I have recommended numerous friends to visit with him as well and they have had the same positive experience that I have had. Paul usually reads you by touching something that you carry with you every day and then during the second half of the session, Paul does a tarot card reading. I was extremely skeptical the first time I went to see him, I did not know what to expect or how the experience would be. Paul was very friendly, honest and I knew immediately he was the real deal. I couldn't believe how much detail he was giving me about my past or the people that were currently in my life. Paul was extremely sensitive with me regarding areas of my life that I needed to refocus and change. That was seven months ago and as I've witnessed many of the things that Paul predicted come to past, I think about how grateful I am that I went to see him. I wholeheartedly recommend Paul's services. He is not only a medium and psychic, he is a great friend. Paul is insightful, honest and covered a lot during the time I went to go see him. I highly recommend seeing him if you want to get solid advice for anything weighing heavily on you. He's the real deal and I will definitely see him again! Definitely definitely real for anyone who has any doubts. My mom & sister had gone to see him before and he helped them as well so I already knew I could trust him, he was completely right about so many specific things and definitely didn't just tell me what I wanted to hear, which is good. He also doesn't say "this is what's going to happen," he makes it clear that you choose your path but he is very honest about what he sees for you. & nothing he sees is vague at all. I left feeling a lot better, & I was SO nervous because I knew he was real and I was like terrified about what he would tell me lol but I left feeling really relieved and I won't get into details but I have been crying for like two days haha & since I left tonight I just feel happier even though he didn't tell me exactly what I was hoping to hear, he definitely just has warmth about him that makes the whole experience even better! Definitely recommend him! I've been seeing Paul for a couple of years now and I am grateful to have his support in my life. He has helped me through some very difficult times. He is kind, compassionate and truly gifted. He gives you insight, guidance and hope. When I feel overwhelmed, he helps me to get perspective and to focus on making things better. If you want to feel that the universe does really look after you, go and see Paul and feel connected, once again. Be open and you will receive a gift from this beautiful soul. Paul is the first psychic I have ever been to and I'm so happy that I met him - he has bought so much insight into my life. He said many things that were on par, even if I didn't realize it at the moment. Now that I look back on it, I see how accurate he truly was. 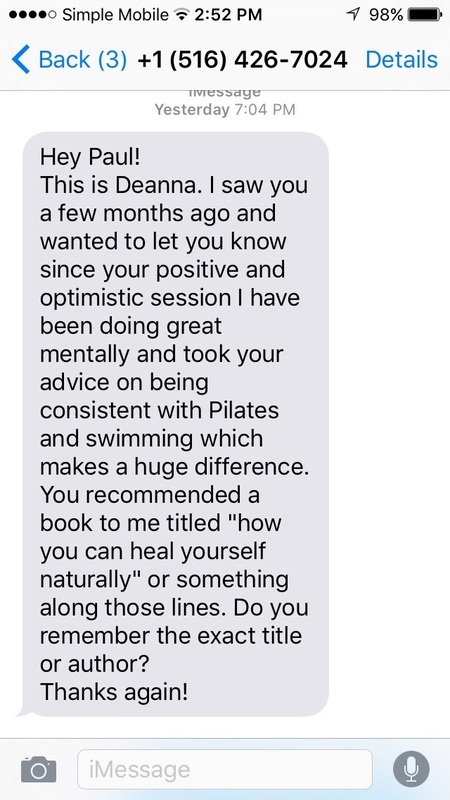 I have also recommended my sister and a friend - both went to see him this month and they are sooo impressed and left with such a positive light. Personally, I have seen Paul twice now and each time, I left with such courage and empowerment. No one knows the future as we each have the ability to create it as we want... but sometimes, we just need guidance and affirmations. :) No matter where you are in your life... Paul has an amazing ability to affirm or help guide you in the right direction. I am so grateful for his being. He is a gift to humankind :) Thank you so much for empowering me to be all that I am and all that I can be. I was impressed by the accuracy of his reading. His first comment when we sat down was the answer to the reason why I went to see him. Great energy all around and very in-tune with his gift. When I left my reading with Paul, my parting words were, "You're scary in a good way..." Paul was specific in his reading. He doesn't beat around the bush, he comes to the point. His reading is not just about telling you the future, he advises. I highly recommend Paul to everyone who needs guidance. I promise you will come out feeling at peace with everything. He is indeed a healer. In all seriousness I rate Paul 6 out of 5 stars. I was beyond skeptical when I went to see him. The only reason I even went was because I felt like I had tried everything else and was desperate to make sense of a very rocky transition. I didn't expect to get much from the experience, but I figured if nothing else, it would make a great story later so I decided to give it a shot. From the moment we started I could tell Paul was legit and truly truly gifted. With tarot cards and his psychic abilities, Paul described my current state of affairs in extreme detail. We spoke very little before we began, and 5 minutes in he was vividly and accurately describing what I was coming out of and where I was hoping to go. I couldn't believe it. Paul was also very kind, supportive and encouraging. During our session he served as more than a psychic; he became a life coach and a friend. I will DEFINITELY be going back in the future! This gentleman is gifted. I visited Paul for a reading after my sister went to see him. Paul's reading of her situation was uncanny and interpreted in a kind and very helpful way. I went to see him after seeing numerous mostly disappointing psychics over the years; it was a singular experience. He told me some good things that seemed quite far out that supposedly could happen within a ten year time span. He said to forget about them for now, but that I would see. Most usefully for the present, he gave me some clarity and relief by seeing things in a completely different way than I could have. It was fascinating to see what he picked up, either through the cards, or just through some insight. At times he didn't even know why something that he understood was significant, nor did I, but then it all came together and it was beautiful and/or jarring. I've sent several friends to him who have found him very helpful. I saw him again recently. He gave me information and the wherewithal to move in a much more positive direction. This is a very big deal, since the rut I was in seemed ironclad. There is little use hiding things from him; he senses when people hold back and will never push. To get the most out of the experience, I suggest openness and a willingness to really hear what he has to say even if it seems totally off. I was suprised how even days later things he said clicked. He is genuinely helpful and positive; he will read and interpret for your benefit only. Tucked away down in the East Village is the real thing, I have been to many psychics and only one or two have been truly gifted. I am not the kind of client who wants to be told "You are a good person". I want the facts, and Paul was able to deliver. 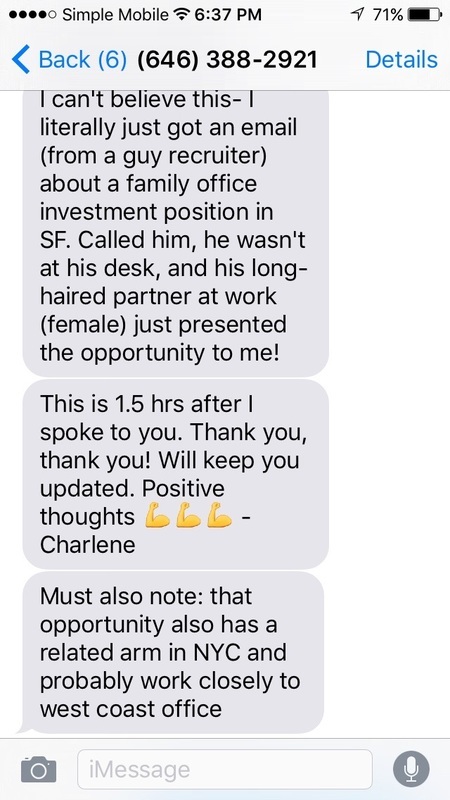 He astounded me with specific knowledge of upcoming business deals and the people involved, and even got the numbers right. Some of those numbers seemed wrong at first, and then came true weeks later. All in all is has been an great experience and I have been back multiple times. It also helps that he is such a genuine person who really wants to get things right. I visited 'Paul 3rd Generation' for my first extensive psychic reading and am very glad that I did! While I was in NYC for a month, I used Yelp reviews to pick out a psychic and now I'd like to echo all the other accolades for Paul's talent. If you're looking for the real deal, you've found him! Just as an overview, Paul used tarot cards along with his innate psychic abilities. For my first reading I was apprehensive and guarded, but I was quickly convinced he was legitimate. For starters he accurately described the person I am dating, my exact age, my current transition between occupations, my dynamic with family members, and even my perspective on work and finances. From here, he shared his impressions on how things will play out and offered advice on the most helpful outlook I could take. Throughout, he continued to be clued in on information that could not be explained outside of his genuine psychic abilities. I walked away with great insight and advice for my approach on this particular transition phase of my life. Further, Paul was pleasant to be around and had very encouraging and grounded energy. I highly recommend him. I have visited Paul once before, and I will admit I thought he was wrong. After a couple of months, most of everything he said came into fruition. We are so used to having instant gratification that I was very skeptical about his reading and then just went forward with my life. One by one the things he told me were unfolding in front of me as I remembered what Paul had told me. He is pretty amazing at what he does.....If you go to one psychic I suggest Paul. He is a good person with positive energy that may not tell you what you want to hear, but he does speak the truth. If I knew what I knew then, I would have paid double for the valuable information he gave me. I think Paul should charge a little bit less what he is charging because he did asked me a lot of information before he gave me his insights. The stuff he told me was not the clearest even though some was right and 40% was not. I am sorry that you felt this way. I am happy to see you again for FREE and clear up those vague answers for you. You are the first person to be unsatisfied with your experience so I would like to try and make it up to you. Please give me a call to see me again. I will start by saying that I am usually not a fan of tarot. I dont understand the cards, and feel like they are so open to wide interpretation. I want details and more concrete answers. Well. Paul has definitely changed my tune on this notion! Immediately, paul went into details about what he was seeing. He said that a tall dark haired man would come into my life, that in fact he was on his way into my life, and he would offer me an opportunity that would be life changing. He said he was someone I knew from my past, older, sort of a mentor type person. I could not even imagine who this could be, and thought he had it wrong. He went on to ask me "what is your dream job" and I said "well, starting my own company, being the boss, running the show on my own, etc" and he said "yes, thats what you will be doing, and very soon too. You will be the boss and this man will help you"
Ok. Now at this point I was not on a job, freelancing, and certainly not in any position to start a business and or be anyone's boss. well guess what. THE NEXT DAY i get a call from an old friend I had not seen in 17 years.....he is tall, with dark hair....he asked me if I could do him a favor and produce this job for him....this required that I start my own company. I did. I launched a company that week and went into production that same week, and was the boss of a crew of about 40. I COULD NEVER HAVE EVEN IMAGINED THIS HAPPENING yet Paul saw it oh so clearly and told me about how it would happen in complete detail. He also said "by the way, there's a family member here, her name is Maria, she's watching over you". Only I didnt have any dead maria relatives. or so I thought. That night my mother called to tell me that my aunt maria...her sister...had died in Argentina the day before. He also mentioned I would sell my apt...but the sale fell through, so Im not sure what happened there. and he wasnt able to see clearly my relationship with a particular man, but he WAS able to physically describe this man and his job and our situation. He just couldnt see where we were going. First of all, Paul is probably one of the nicest men on the planet -so no matter what you are going through, you will instantly feel better, just by being in his presence. He is very kind and supportive, and exceedingly insightful regarding the dynamics of any situation you might be involved in. I am involved in a messy lawsuit, and Paul accurately read all the players involved. A lot of psychics will speak in vague generalities, but Paul pinpoints exact behaviors and character traits. I will absolutely consult him again. Seeing Paul was a truly wonderful experience, I cannot recommend him highly enough. His uncanny ability to sense who you are, on the deepest level, defies explanation. He tells you like it is, but in a genuinely caring way. Usually the words "positive energy" make me roll my eyes, but this is the only way I can describe what he gives out. A lovely man and the genuine article. He is a great psychic. Very accurate and right on point. Will certainly see him again. Paul gave me a better confidence in myself to achieve my goals. His readings were on the dot and he has great energy. I left the room feeling light and cleansed. Paul took away all my negative energy. All I wanted to do was smile all day! (Up until I received negative energy from my friend). He has inspired me to balance myself, enjoy the life I want to live, and stay focus. Thanks Paul! Will come back for another visit - Christine. I must say that I was beyond skeptical and reluctant before going to see Paul, I had no idea what to expect or whether this was a scam. 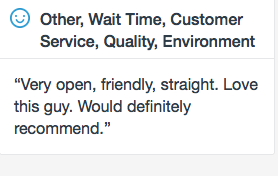 I was beyond pleasantly surprised and can not recommend Paul enough. He is genuine, compassionate, kind, warm and endearing. He gives off the most positive energy and his space is warm and welcoming. While I went to Paul to get a glimpse into the future and he was incredibly well versed at doing that, the added bonus is that I feel healed. He is a healer, I needed healing, and that's what I got! I felt light, energized, encouraged and with a renewed outlook. 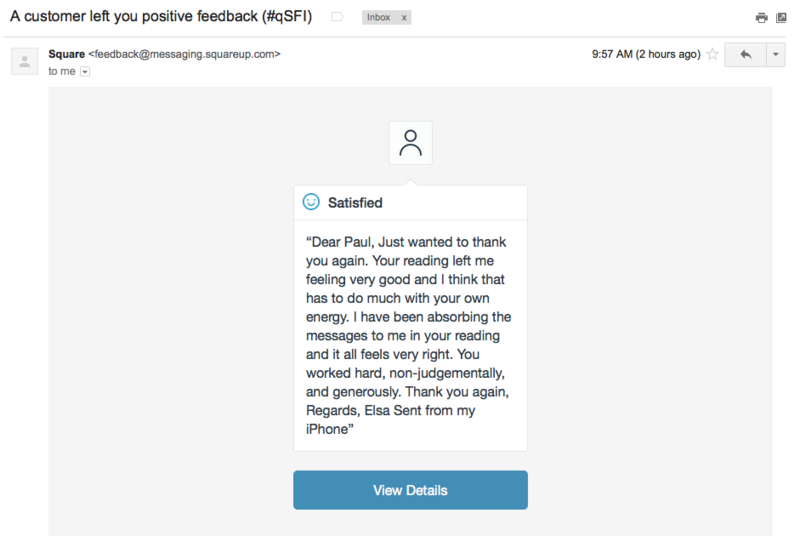 Paul really helped me more than anything as a life coach, he told me where I was potentially hurting myself without knowing it and then told me exactly what to do to rectify. Can't thank him enough and I am sending two of my friends to him. He has a true gift and is so sweet. He is also very thorough! peace is what you get when you leave his office. accurate, to the point, and looks out for your good. I have never had faith in such things since I have seen a lot of scams, but going to Paul changed everything. I wish him all the best! I visited Paul this past Sunday after my roommate and I decided it would be beneficial to visit a clairvoyant at the start of the new year. I was immediately put at ease by his gentle, honest, sincere presence when I arrived, and I was amazed by his accuracy and intuitive capabilities. He can very easily hone in on a person's energies, and everything that he read or sensed about my nature, past relationships, and present relationships was spot-on. I have so many great things to say about Paul's reading, but, to summarize, it was very reassuring and uplifting, and I think it provided me with a lot of direction that will be helpful in the coming year. I will definitely be back to visit Paul! I extole the wonderful gifts of Paul and HIGHLY recommend him to anyone that seeks guidance from a human being that truly cares. He is beyond a psychic; he is counselor, friend and advocate all at the same time. I had some choices to make and with my input together we were able to examine the benefits of each. I came in frazzled, and left calm. Paul is great! He made me feel very comfortable and the burden of negative energy I carried was definitely cleansed off with my reading. He really helped sort the weight I carried on my shoulders. He is very thorough with your reading. He is very intuitive and personable. I would highly recommend him to a friend! He is truly amazing! He knows what he is talking about. I highly recommend him. Very helpful! Plan on going back many many times! Amazing! Aside from making me feel reassured and more confident in my recent decisions, Paul is an incredibly insightful person who helped me see things from a different perspective. I left feeling lighter, brighter and happier than I had in weeks, and with a more positive outlook on what is to come. Thank you Paul! See you again soon! Seeing Paul was one of the best decisions I have ever made. There are no words that I can use to convey this experience, but I believe leaving a review is the only way I can truly thank him. Currently I am on a path in my career and personal life that fails to give me fulfillment and Paul not only recognized my restlessness immediately, but he was also able to provide me with guidance. His reading was incredibly accurate and his insight is truly valuable. I appreciated his honesty and I believe that he gave me his reading with my best intentions in mind. I cannot express enough how accurate Paul was. I believe that all who see him feel like they have been emotionally cleansed and look forward to living the rest of their lives. Since seeing him, I have sent friends and family members his way and each have had very positive things to say. Spending time with Paul is like spending time with a close friend, he never rushes you and will never say anything that will hurt you, but is very honest. I wish him all the best! One of the best & accurate readings I have had (and I've had quite a few & all different kinds). Paul was so genuine and sincere and instantly made me feel comfortable and at ease. I went to see him during a particularly chaotic & confusing time and he reconfirmed alot of the things I already sensed and knew was needed. He pretty much immediately picked up on aspects and people in the forefront of my life. He focused in on my energy and was able to 'see' pictures that were relevant to me and then we did a tarot reading which reiterated & confirmed the prior discussions. He gave me insight and comfort which I can't thank him enough for. I have never written a review on Yelp before, but I figured this is how I could give back to Paul. I will absolutely be seeing him again and have recommended him to family and friends and now to the yelp community! Paul has a real special ability to pick up on your energy and what is going on in your life. Usually he touches a personal belonging that I carry on me day to day, and he tells me things that are happening or about to happen. Paul has foreseen events in my life that played out in months to follow, which I was amazed at. My sister and mother also saw Paul, and were impressed with his readings. At one of the hardest times in my life I turned to Paul for help and advice. I needed a roadmap of where my life was going and he provided it. With his gentle guidance and deeply intuitive insight, I rest assured that all of the turbulence that I have experienced has a light at the end of the tunnel. Thank you Paul. i have booked him for Tarot card reading parties with other friends and know that all will be a great successes! I've been read by quite a few tarot readers, and mediums. Paul is by far one of the best and most accurate psychics I've been to. If you have questions or concerns about any topic of your life, Paul is definitely the guy to see. He gets booked pretty fast, but if you call in advance you can book a spot pretty quickly. Paul adzic has a gift. He has an abaility to connect with those he is reading, providing insight in a sensitive and honest way. There are many out there who claim they can do readings - skip them and go to paul since he can doesnt just claim to be able to do this, but actually delivers. I was amazed. I have worked with a number of psychics and mediums over the years - and was most impressed with Paul's innate gift to read with great accuracy and sensitivity. I was amazed by the level of confidence and respect with which Paul shares what he sees; and in addition to his confidence, there is a great calm and care in his delivery - I would recommend him to anyone and through his eyes - you will see things that invoke thought and great insight - a genuine gift!